Victoria Tower was built in 1848 to commemorate the visit of Queen Victoria and Prince Albert to the island in 1846. The visit was brief but was of great importance to islanders as it was the first by a reigning monarch. The tower was designed in 1847 by William Colling, who worked for the Scottish architects William Burn and J MacVicar Anderson. Colling drew inspiration from medieval Italian buildings such as the Palazzo Pubblico in Siena in order to suggest the ideas of prominence and majesty. The tower includes different types of stonework and architectural features which were designed to represent the Queen, her empire and her achievements. Construction began in 1848 by Guernsey builders Matthieu and Jaques Tostevin. The Governor of Guernsey, Major General John Bell, laid the foundation stone on 27 May 1848 in the presence of the Island's Bailiff , Peter Stafford Carey, local officials and the Militia. There was a large gathering of inhabitants, including those of the poorer classes who would be employed in the building work. A time capsule was buried deep in the foundations. After the laying of the stone, the ceremony was blessed by Reverend Thomas Brock, the Rector of St Pierre du Bois. The flag was hoisted, a 21-gun salute fired and the assembly sang the National Anthem. In the subsequent speech given by the Bailiff it was made clear that the events of the day symbolised the loyalty of the Guernsey people to the English Crown. 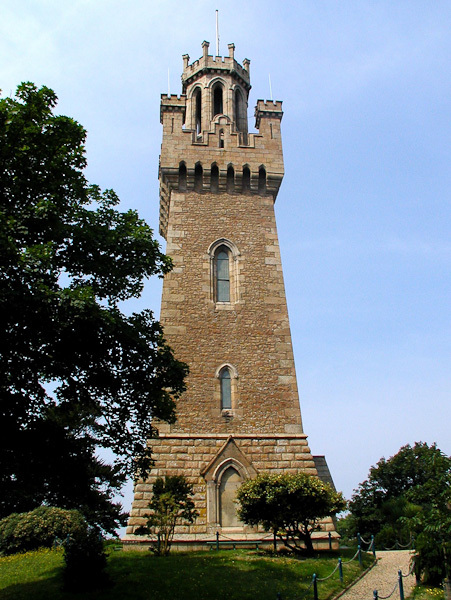 In total the tower cost around £2,000 to build, which was paid for by public subscription. It was built on land donated by the estate of Peter Mourant. This elevated position, 200 feet above sea level, had been the site of a windmill and before that a menhir or standing stone. The tower is built largely of red granite from the Guet quarry at Cobo, on Guernsey's west coast. It is square in design, with a fortified parapet and angled turrets. The whole structure is crowned, almost quite literally, with an octagonal lantern topped with a coronet. Overall it stands 100 feet high. There are spectacular views across St Peter Port and the north of the island. The key to the tower is available from Guernsey Museum in Candie Gardens during normal opening hours. Visitors are advised that access to the viewing platform is via a steep and narrow spiral staircase, although there are places to rest when both ascending and descending.